Pat H. writes: A friend of mine showed me a 1996 $20 bill last evening. He took it to the bank thinking it was probably counterfeit. The bank employee told him they would exchange it for him as it was a good bill. It looks like the left hand upper corner was folded over when it was printed and is blank, with the print on the back in the upper right hand corner. It this a collector’s item? Yes. You have a “fold over” error note. The paper was accidentally folded over when printed. When you open the fold it is blank underneath. The value depends on what kind of “fold over” error it is (there are ones with extra paper from a miscut sheet) and the size of the fold. For this error, a minimum market value is about $50 and depending on the degree of the error up to about $400. Jeremy writes: I have a 1946 walking liberty half dollar. The lady and the sun on front are both gold or gold plated and the reverse is completely gold. It has no mint mark. The letter W appears on it beneath the eagle’s wing next to the rim. It may pssibly have the letter A printed Beneath the middle arch of the W as well. It is in immaculate condition. Have never seen or gotten any info on this type of half dollar. Have been told the W or W A may be the artist initials and the coin may be very rare. Any info would be gratefully appreciated. You have an altered coin in which some of the elements have been “colorized”. This seems to have become a popular souvenir item and ads for just this kind of business can be found in the Sunday papers in journals like “Parade Magazine” and elsewhere. The colorization is not the way the coin was originally minted but simply a modern scheme to sell circulated, common date Walking Liberty half-dollars at a significant premium. The examples I’ve seen usually grade about EF and have been cleaned and polished to make them look “new” to the uninitiated. Circulated “Walkers” can be purchased for a few dollars. They are available in any quantity you can imagine. 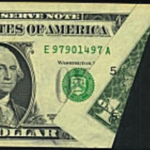 Collectors prefer to buy uncirculated specimens of this date since the date is common and relatively inexpensive. “Colorizing” the coin makes it just worth its silver value to most collectors (about $6.00). If you like this sort of thing, enjoy it but don’t expect altered coins to appreciate in value. This is not a rare coin. The monogram AAW is found under the tip of the wing feathers and are the initials of Adolph A. Weinman, the designer. Coins without mint marks were struck in Philadelphia. Shane E. writes: I have a new 2000 Maryland Quarter with a slight bump at the very tip of the chin. What is this? I was wondering if any other Maryland quarters have been reported having this on them & if not what could possibly be? You have a “cud” caused by a broken die. Die cracks and “cuds” are the result of a die that is at the end of its useful life. A piece of the die literally fell out and the missing area filled with metal on striking, causing a raised lump. Dies can crack from being at the end of its useful life or from using too much striking pressure. Coin from cracked dies have a raised jagged line at the cracks location. If the die is used further it can, as in this case, begin to actually fall apart. On Washington quarters, normally, small cuds bring $10 or so and large ones $25. The State quarters have become so popular, especially the errors, that I have no idea what cuds for those currently bring. I’m sure it is far an above the normal market (Sell while everyone is delirious!). Kurt writes: I’ve found a 1996 nickel which appears to be copper. Is it possible or did someone just deface it? 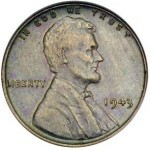 United States 5 cents pieces are struck on planchets consisting of 75% copper and 25% nickel. Most of the time the nickel has a silvery appearance as the coin’s color is dominated by the nickel metal. The nickel is very hard and does not corrode. In the presence of a strong oxidizer (acid, base etc) the nickel will take on a copper color. These coppery “nickels” are fairly common. Errors do exist where a cent blank was struck with nickel dies (possibly a lone cent blank mixed up with nickel blanks). This error will have part of the outer design missing (since the planchet is too small), will be thinner than a standard nickel and will weigh less. These are easy to identify. Five cent coins weigh 5 grams, copper cents (pre 1982) weigh 3.11 grams. The coin was struck from planchets from improperly mixed alloy. It is possible for the copper to come to the surface creating a coppery look to the nickel that eventually tones to a dark brown or black color. These do not bring a premium as they are of full weight and of the proper metal. N.C. writes: I found a 1988 D, 100% zinc (no signs of copper at least), Lincoln cent. It still has all the images, but is a little scratched and could use some cleaning. I got it as change somewhere in the last month or so. I definitely see the need to clean this and know its showing some wear, but from the pictures I sent can you give me any idea whether the coin is worth keeping? If it is, how do you recommend cleaning it up properly? Thanks in advance. All Lincoln cents after 1982 are pure zinc with a copper plating. Your coin is missing the plating layer. Error collectors buy these coins at a premium. In the condition of your specimen, considering the damage, the market value is about $2. Cleaning the coin would render the value zero. See the CoinSite Feature What’s it Worth? to see approximate market prices for errors. See the “Lamination Errors” Table for more errors including other coins missing layers of metal. 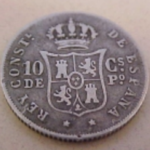 Jeanell S. writes: I have a 1820 Silver dollar and I would like to know if it is valuable. Could you please let me know, how to go about finding out if it is valuable. 1. 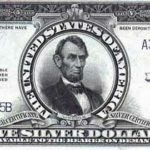 You do not have a United States silver dollar but maybe a coin of another denomination (half dollar?). 2. You have a silver dollar from a later period with an altered date, that means the date was changed with a special tool. This kind of fabrication has no meaningful monetary value except as a curiosity. 3. You have a “dollar size” coin from another country. One way to tell what you have would be to describe the coin or send an image. There were specific designs in particular eras. For example, Draped Bust silver dollars were struck from 1795-1803. Gobrecht’s Seated Dollar with a flying eagle reverse were minted from 1836-1839. 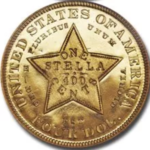 The Seated Dollar with stars around and a eagle with open wings from 1840-1873. Morgan Dollars with a bust of Liberty facing left from 1878-1904 and then again in 1921. Peace Silver dollars intermittently from 1921-1935. You can see values of the most common dates of U.S. coins on the What’s it Worth? feature on CoinSite. Jim D. writes: About 15 years ago I was going through a bag of new nickels. I found three coins that were nickels struck on the penny blanks. These were perfectly struck but are smaller than a normal nickel coin. Any idea what these are worth? Yes, those are fairly scarce errors. Cent planchets got mixed with the nickel blanks creating a nickel struck on a cent (a 6 cent piece?). Often the outer design of the nickel will be missing as the blank is too small for the die. Usually the flan (planchet) is thin as it stretches out to attempt to fill the collar to compensate. Approximate Value Range: $60-$100 each. Ed P. writes: I found a South Carolina quarter with gold color on the heads side and silver on the other side. Is this normal? You have a Lamination error. See United States Clad Coinage. Also see Error Coin Values for a table of Lamination Error prices and prices for State Quarter errors. Note that clad quarters have been made since 1965 and have no silver content.